Virginia, we have excellent news! Not one, but two venues are starting trivia on Thursday (7.5). 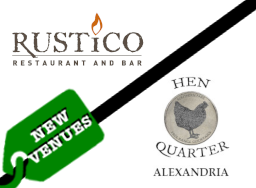 Join us at Rustico in Ballston OR Hen Quarter in Alexandria. Both are free to play, both have prizes to be won, and both have your chance at $5000 cash! Don't forget to study up with the Hint of the Week!